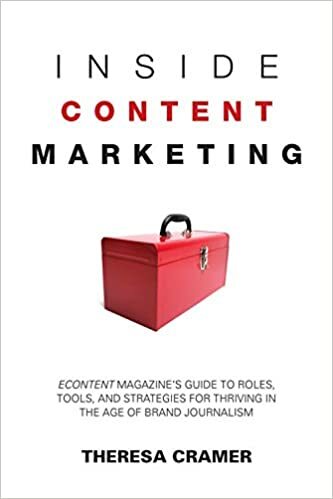 DIY – Writer. Editor. Storyteller. You may remember that last year, I gave my office a makeover…sort of. At the time, I wasn’t quite ready to completely overhaul the space, and was working with what I had on hand. That came a few years after replacing the old desk that was falling apart, with a couple of IKEA table tops. Recently, however, I decided to have a tag sale and once I made up my mind about that, I realized it was time to really re-do the office. I wanted to get rid of the big dresser/credenza that took up too much space, and so I needed to rework the office before the tag sale. 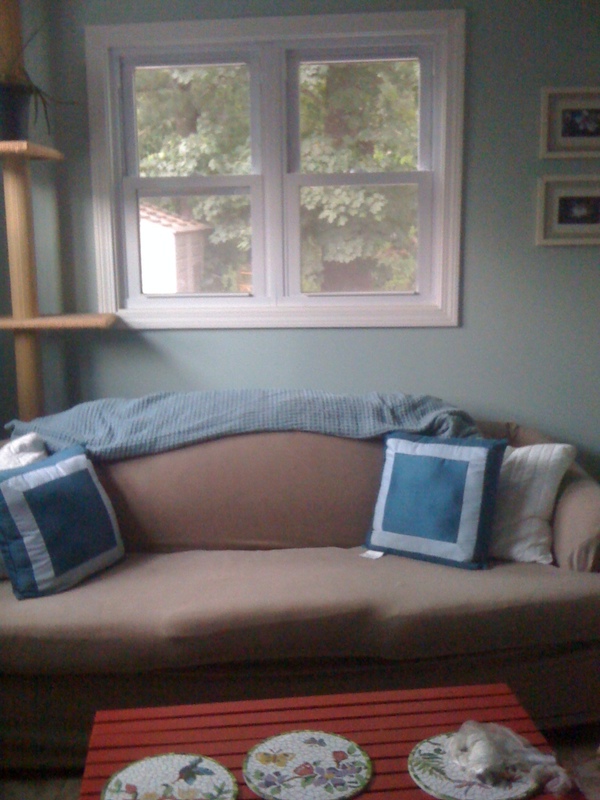 I have this room at the back of my house that is part mudroom, part laundry room, and part sun room. My cats spend more time there than anyone else. They lounge on the old couch that is out there, eat their meals there, and use the litter box out there. There’s a big expanse of wall that has been repeatedly damaged by water, and so I’ve been hesitant to do much of anything to it–even though I couldn’t stop daydreaming about how I would turn that wall into my well organized dream storage unit. 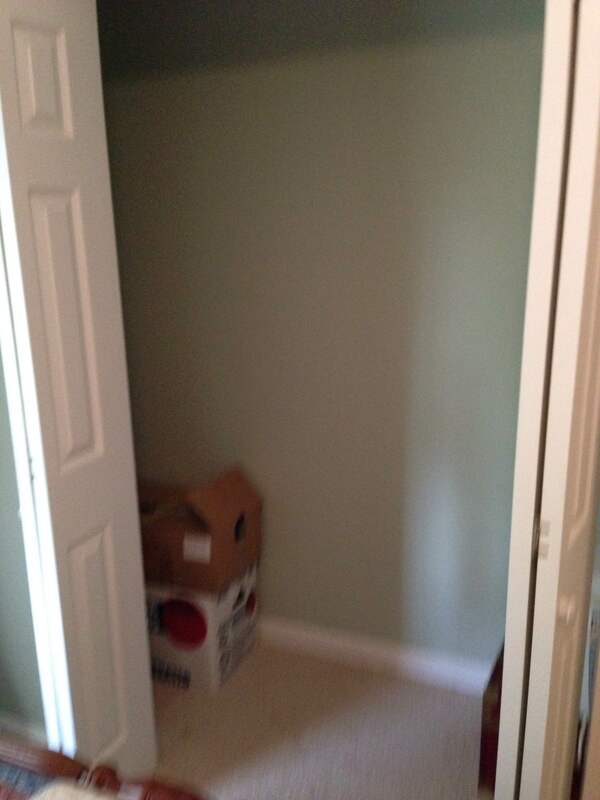 When I first moved into my house there was nothing in the closets. No poles or shelves of any kind. My friend, Allison, and I went to Home Depot and quickly racked up a bill that had us voiding the sale and heading back to the aisles to buy a much more economical closet kit for my bedroom closet, and a few shelves for a utility closet. We left the guest room and coat closet alone for the time being. I eventually put a shelf in the coat closet (which I don’t actually keep coats in) but four years later all the stuff in the guest room closet was still sitting on the floor. I decided to tackle that project this weekend. Despite the 90+ degree days here in Connecticut, summer is over. Labor Day has come and gone. Kids are back in school. I spent the weekend at a friend’s wedding on the water in Mystic–and then recovering from a night of drinking and dancing. But I spent my day off knocking another project off my list. 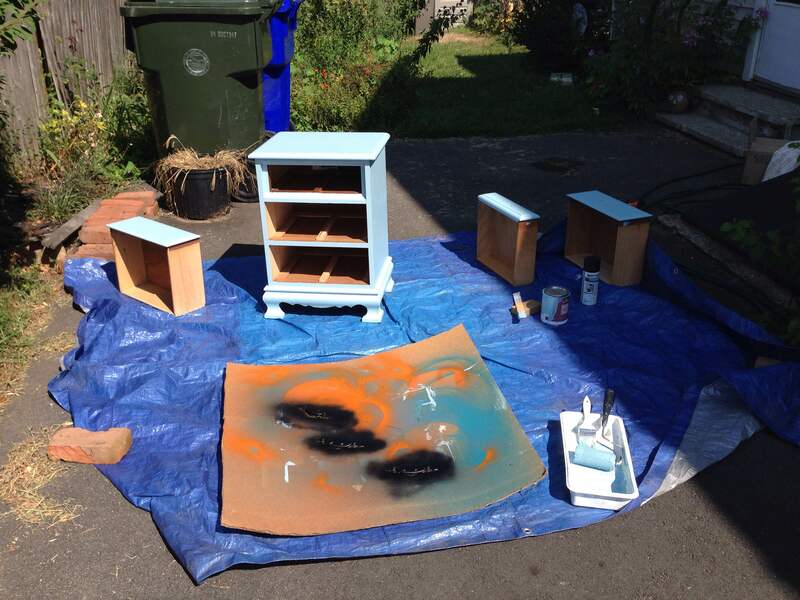 Four (and a Half) Down: Paint, Paint, Paint! A couple of months after I moved into my house I cam home in the middle of a downpour to find the paint in my “mudroom” (I put that in quotes because it’s just a weird room that functions as a laundry room/mudroom/place where the cat stuff is) bubbling. This particular room is part of a one-story addition on the back of a two-story house, and the wall in question is the one that separates the original house from the addition. Water was getting in somewhere, and getting behind the paint. You could literally pop the bubble and water would come pouring out. For months I looked for the source of this problem. The water only came in once in a while–clearly when the wind was blowing in a certain direction, and the rain was really bad. No one could figure out where it was getting in. At one point we even removed the siding to have a look. It didn’t look wet at all behind the siding. Finally I got someone up there with a hose, and we realized there was a small spot in the corner of a window where there was no caulk. So we fixed it and I waited for months, though all kinds of weather conditions, to see if the problem was truly fixed. Then I fixed the wall. For a couple of years, everything was fine. Then it started again. This time I decided to skip the caulk and go straight to As-Seen-On TV methods and use Flex Seal. So far, so good. I like used furniture. Most of the time, I won’t even consider buying something new. I walk into a furniture store and find myself knocking on bed frames and dressers wondering what they are made of, and deciding it definitely cannot be wood. I prefer to troll Craigslist for people who have money to waste, and like redecorating their homes. (It’s important to zero in on certain zip codes to make this work.) But after years of sitting on couches with mysterious origins, and covering them with slipcovers and blankets, I have become obsessed with the idea of finding and buying a couch I actually like. As you may have read, I spent New Year’s Day giving my home office a bit of a makeover… and that — combined with hours spent browsing Pinterest on my iPad — has got me spinning out of control. 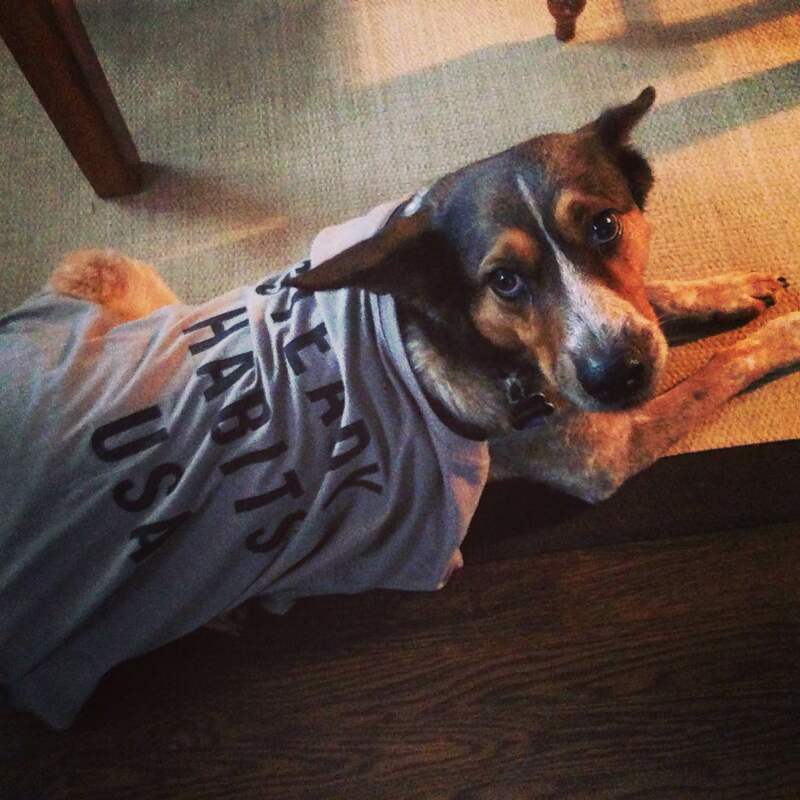 Are there reno rehabs? Because I may need one. You see, shortly after I gave my office a makeover — or at least a corner of it — I also picked up a box spring for the new bed I bought a few months ago. Bitten by “the bug,” I also decided to move a bookshelf out of the office and up to my bedroom in order to free up some floor space. This made me start thinking harder about my bedroom, which is rather large and has become a bit of a dumping ground (much like my office). And my brain hasn’t stopped dreaming up ideas since. Now that’s an IKEA hack! I have a new obsession: XOJane. I just can’t believe some of the things the writers will admit to…but I totally appreciate that they do. I’ve got furniture scattered around my house that was either donated to the cause (and by “cause” I mean “me”), picked up at tag sales or from the side of the road. I got lucky when some of my roadside finds didn’t need refinishing. For instance, I somehow managed to find chairs on the curb that matched the table I bought from Craigslist. A couple of chairs and a bedside table I found at a tag sale were just great from the start. But there has been a corner hutch near my stairs that has been taunting me for almost a year now. 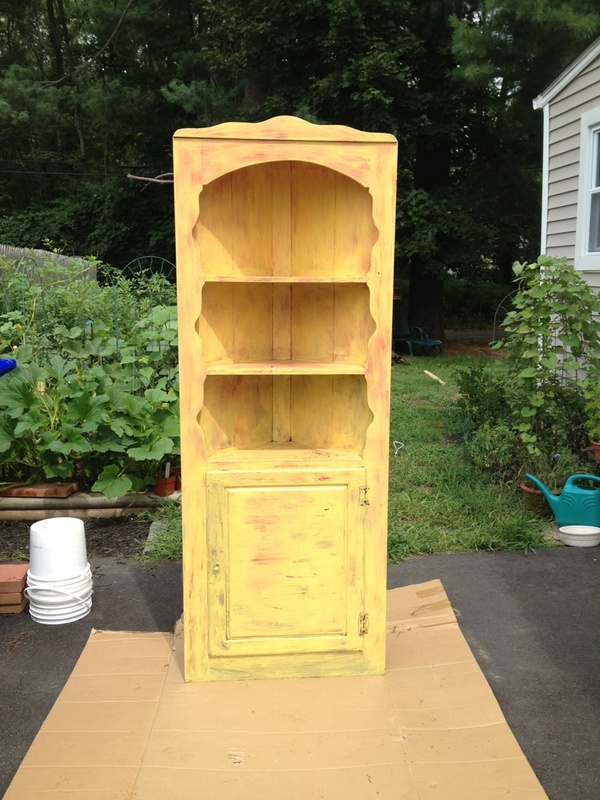 It was a nice hutch with a hideous paint job…but it was free. Every time I pass by it on my way up or down the stairs I would curse it’s terrible color. I’m not sure if you can tell just how ugly it is from the picture. It almost looks like raw wood, but really it’s yellow with red “accents.” I think someone was trying to make it appear distressed, and I suppose they achieved their goal in some ways. So my cousin and I decided to tackle this project on Sunday. I’d had a bottle of spray paint sitting around for a while. 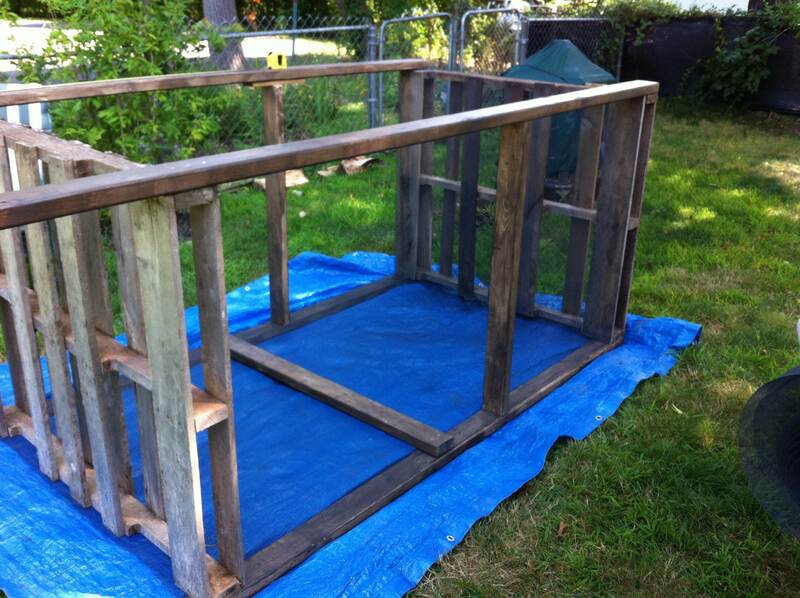 And we made quick work of spraying the hutch with what I thought was a dark blue-gray color. But once it was on, it looked very, very purple… like Grimace. I started thinking about buying fabric but I wasn’t finding anything I really liked. So I decided to look at sheets. I headed off to Target, thinking I could probably get away with buying one flat sheet. When I didn’t see one that appealed to me, I headed over to the shower curtains aisle and I was overwhelmed with choices! 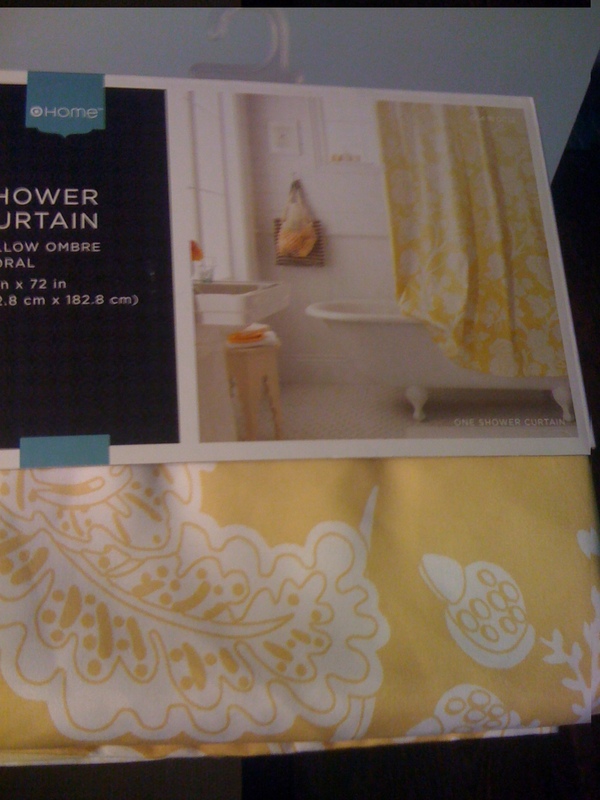 Shower curtains tend to be a bit funkier and more colorful than the average drape. I found so many I liked (cotton, not plastic) that I barely knew what to do with myself. A few weren’t in stock, so that narrowed down my choices. 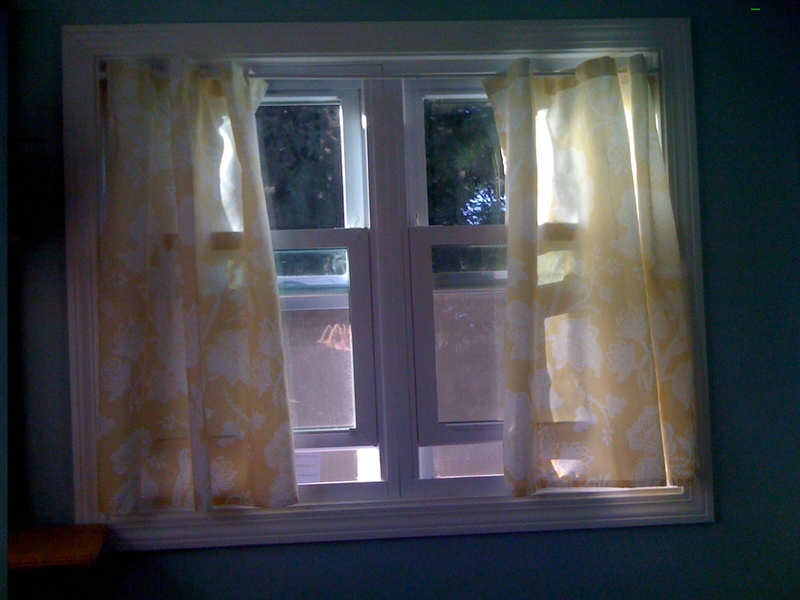 (Next time I’m in the market for new curtains you know where I’m going…) For $19.99 I bought one shower curtain that I was able to turn into two sets of curtains. A few quick cuts, and a couple of sewn hems later, I had exactly what I’d been looking for. 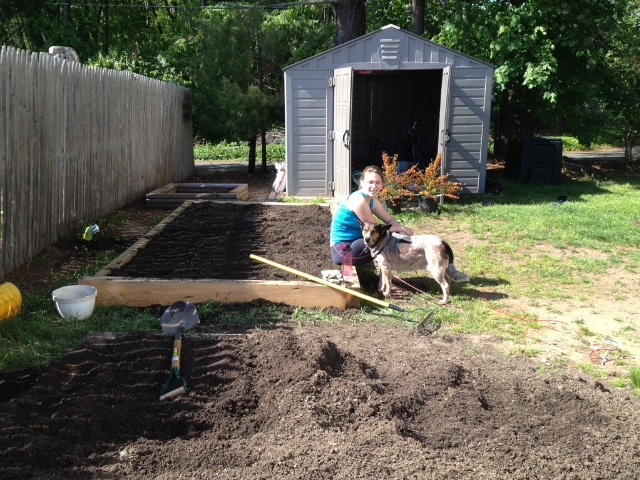 I have this slightly obsessive need to document my garden’s progress. It’s a rather strange manifestation of OCD, but whatevs… When you first put in your starter plants it’s hard to imagine what they’ll look like in a few months. But if you take pictures every week or so, you start to realize how quickly the little guys grow and how easy it is to overlook the change when you see your plants every day. Tomato plants make for especially good pictures, thanks to the rungs on the tomato cages which clearly mark your plants’ progress. As long as I’ve got this picture taking compulsion, I may as well put the results to good use and blog about it. Long before I even moved into my house, people started giving me stuff they no longer wanted. 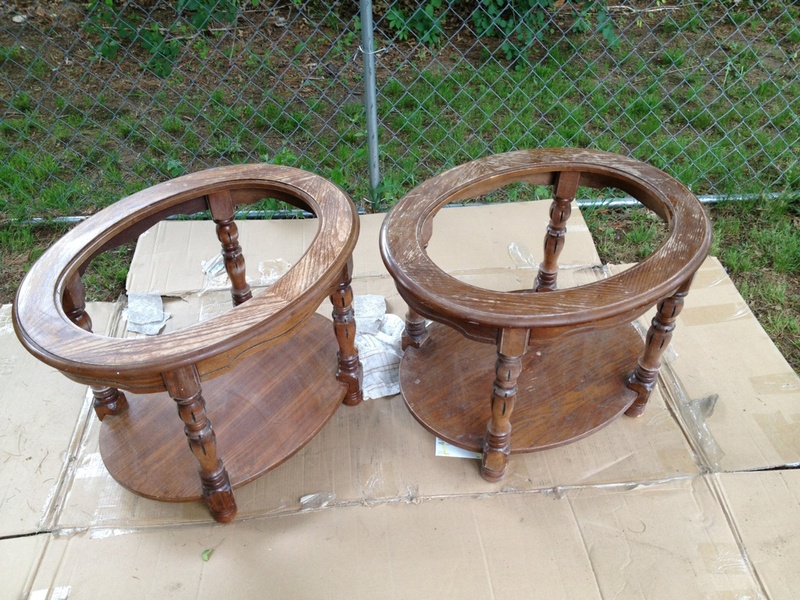 For instance, my aunt gave me a couple of end tables I wasn’t particularly fond of but they did the job. But this week I decided it was time to start tackling some of the furniture rehab projects I’ve been planning. Tables before being painted, but after a light sanding. I am developing a severe Pinterest addiction.